There are 14 ways to get around San Antonio, Texas, and 14 of the best ways are available through an app! Choose between 1 carshare, 3 taxi, 6 rideshare, or 4 black car/limo companies. 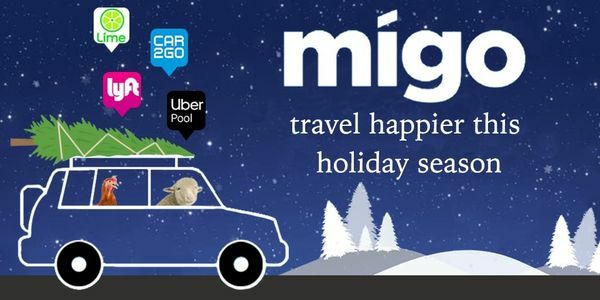 The best 2 ways to get from A to B in San Antonio are on Migo. Whether you need the closest, cheapest, or fastest ride, Migo has all of them in one app. Scroll down to see all the different transportation apps available on iTunes or GooglePlay. Choose from one of the providers below to help you get around San Antonio today. A peer-to-peer transportation network company that provides private, scheduled, and fixed-price rides. Head to Market Square for unique and colorful souvenirs and textiles to take home and remember your visit! Visit the McNay Museum, a beautiful colonial structure that houses thousands of works of art that everyone will enjoy! Hungry before the big game or concert? Head to Dignowity Meats, a local favorite known for their smoke meat sandwiches and craft beers! Experience cutting-edge contemporary art at the Blue Star Contemporary Art Museum, located right on the San Antonio River! Enjoy the fresh night air and colorful lights all along the River Walk, grab dinner or a drink at the Agave Bar, or one of the many other restaurants! Stop by the Mi Tierra Cafe y Panaderia for some classic Mexican pastries and food, or just swing by to appreciate the mariachi bands that wander freely! Check out the Alamo website for monthly events, book signings, and reading that highlight certain historical events and facts surrounding the Alamo! The San Antonio Airport offers a rewards program for shopping and dining in the airport! Get registered online at their webiste, and earn points whether you're dining, shopping, or just parking at the airport. Read about what's new at Migo in San Antonio.